Recently, I checked out a concept design for a traffic light with only one light. Do you know the exact reason for having three lamps in a row, instead of one like in this concept? In London, England in 1865 there was a growing concern over the amount of horse-drawn traffic causing danger to pedestrians trying to cross the roads. A railway manager and engineer named John Peake Knight, who specialized in designing signaling systems for the British railway, approached the Metropolitan Police with the idea of using a similar semaphore/lighted system for road traffic. In the daytime, this semaphore method used an arm or arms that could be raised or lowered by a police officer, notifying carriages when they should stop when the arm(s) stuck out sideways. At night, his system used the red and green colors to indicate the same type of thing, again traditional to the railroads. In 1920 in Detroit Michigan, a policeman named William L. Potts invented the four-way, three-color traffic signal using all three of the colors now used in the railroad system. Thus, Detroit became the first to use the red, green, and yellow lights to control road traffic. In 1920, there would be little option other then to provide 3 independent lights to show 3 different colors. While other options might have existed, their complexity may have limited their adoption. To specifically call out the reason above: because of technology. Today's technology allows for amazing things, but to think that a single-light traffic signal would be both technologically and economically feasible in 1870, 1920, 1980 (or even 1990) is a very hard argument. You can argue the ability in the later years, but can you argue the economics? Technologically it is very easy to put 3 lights in a row and tell them when to turn on or off. Economically it is very easy to put 3 lights in a row and tell them when to turn on or off... and fix them when they break. The technology to do it "this way" vs "that way" is simply a lot cheaper. EDIT: Some comments on this answer were not taking this section in the context of historical precedence. I have attempted to clarify the points being made, in the greater context of my final answer at the end. I have also corrected some information on standards which where inaccurate. While "because of color blindness" is a popular belief of the historical, this is simply false. Looking back at the historical reasons, for the time when traffic signals were being developed, the idea of catering to a rarely known condition would be unheard of. The first electric traffic light was developed in 1912... It had two colors, red and green, and a buzzer. All of these different types of lighting systems began to present a problem. Drivers could drive through different areas and encounter several different types of systems, causing confusion and frustration. So, in 1935, the Federal Highway Administration created “The Manual on Uniform Traffic Control Devices.” This document set uniform standards for all traffic signals and road signs. Note that these standards were put in place for the benefit of everyone! This was not an action taken on behalf of "color-vision deficient drivers". No mention of such a population is made in the 1935 Manual on Uniform Traffic Control Devices (p. 71). 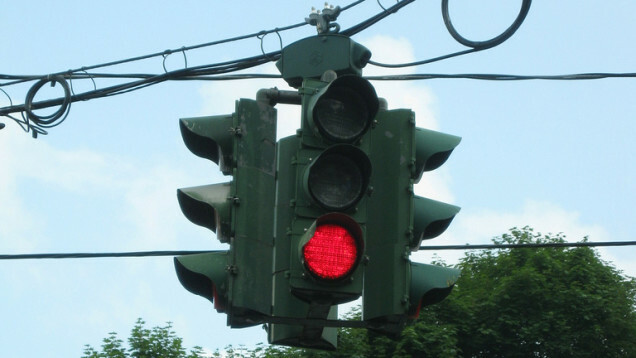 The idea that the order (Top = Red, Middle = Yellow, Bottom = Green) is for color blind individuals is quickly debunked when you search for "sideways traffic lights". Order is common, and mostly followed, but standards are not always followed and the original development of the traffic signal pattern was not guided by the standards that exist today. There were also no standards in traffic light shading of the red/yellow/green colors - meaning one traffic light may use shades that allow certain color blind individuals to distinguish red vs. green, but another may not. While standards exist today, these did guide the use of these colors or their shades during early development. Color blindness does not mean you can not see color (except for the very rare "achromatopsia" condition) - it is possible to provide shades and luminosity that do work for the majority of color blind people. But it does help! Certainly the positional nature helps colorblind people, as long as they know what order the lights are in. This is very likely a reason why a single-light concept would be very difficult to implement, given today's attitudes and awareness of safety (for all drivers). However, the point here is that color blindness is not a reason why they were made that way in the first place. Historically they were made that way; improving over time until the technology to create and maintain them became less and less; creating a situation where the economics to change them are prohibitive. Yeah, I know - it's a UX site. Sometimes things can't be explained in terms of UX. Sometimes things exist simply because they have existed that way for so long. One reason for the three lights, in the UK at least, is that you have many states. Two of the lights can be on at one time, i.e. 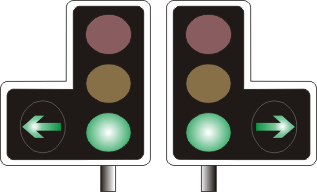 red and amber signalling that you should get ready to go, where as a single amber light would mean get ready to stop. The concept you link to doesn't cover this use case. There are also historic reasons for the 3 light traffic signal, they used to be operated my humans and originally were gas burning lamps (briefly) - this was before LEDs even existed, so they needed 3 states. Traffic lights all started on the railway, the amber light was a signal to slow down and give the train driver advanced notice it's state was about to change. With the specific implementation you mentioned, I can also see a few other use cases (on UK roads) that would be rather difficult to implement - traffic signals do more than tell people when to stop and go. @Steve Wortham also makes a great point that a moving light (much like something animating on a web page) is more likely to catch your attention than a single light changing colour, especially if you are not paying complete attention. Another reason why we may not have changed the design so much could be that - if we were to change the traffic light system, it would cost a HUGE amount of money for a government to not only implement the lights themselves but to also teach and educate road users of this new system. I think a big reason must be that it's easier to see that the light changed (even out of your peripheral vision) when one light goes off and another goes on in another position. The fact that the position AND color of the light is changing makes it easier to notice. A few answers have made the point that it would be difficult for colour blind users to see the signal. But the truth is, we are all colour blind at least in our peripheral vision. From your eye's fixation point, at 30 degrees you start to lose trichromatic vision. In other words, you start to lose the ability to differentiate colour. At 50 degrees, you are essentially colour blind. The colours that you see right now in your brain aren't actually 'seen' -- your brain has coloured in the gaps for you. However, your eyes are good at detecting movement in these extremes. Our response is to saccade to movements in our visual field so we can see them in more detail. With a single-bulb system, we might be unable to see a change from green to red because, in our peripheral vision, nothing has changed. So it is not only colour that is essential to the signal, but the movement of bulb position which prompts us to fixate on the signal. The accepted answer contains some good information about the history of traffic lights, but it is dead wrong about the color blindness issue. There is (in the US) a legal standard for traffic light color. The MUTCD requires signals to comply with ITE standards that specify luminosity and chromaticity of "red", "yellow", and "green". Indeed, the "green" color has a slight blue hue to aid people with red/green colorblindness. The order of the colors is also specified by the MUTCD for both vertical and horizontal alignments. Red is always on top (vertical) or the left (horizontal). That one intersection in Syracuse is a curiosity, and technically not legal. Q: How do the standards for traffic signals accommodate the needs of color-vision deficient drivers? Would it be better to add shapes to the signal indications to help the colorblind identify which signal is on? A: Distinguishing reds from greens is by far the most common problem for color vision deficient people. This has been taken into account in the MUTCD, which since the 1930s has specified the relative positions of the different colored signal indications, with red always being above yellow, which is always above green (in a vertically-arranged signal.) This positional requirement also applies to arrow indications, with red arrows always being above yellow arrows, which are always above green arrows. For horizontally-arranged signals, similar positional requirements are established, with red always being the left-most indication, etc. It would seem logical that shapes could potentially provide additional assistance to colorblind road users, beyond that already provided by the positional standards. However, a Canadian province that has used such a shape system in its traffic signals in the past has abandoned it due to lack of effectiveness and other issues. Changing the shape of the signal indications results in changes in light output and this impacts how well and how far away the signals can be seen by drivers, particularly under adverse conditions such as fog, smoke, dust, visually complex environments, etc. Therefore, research would be needed to evaluate what changes in signal light sources and intensity might be necessary if the shapes of the lenses were to be changed, and also how colored arrow signals could be associated with shapes. Meanwhile, studies have found that most color blind people adapt and compensate well by using the positional requirements contained in the existing traffic signal standards to help them discern the colors. Also, in the most recent update of the detailed color standards for traffic signals (published by ITE), the green has been specified to be a bit more "blue-green" because this makes it easier for persons with red-green color vision deficiencies to distinguish it from red. In other words, color blindness has long been a consideration in the design of traffic lights, and it's one of the reasons we keep three separate fixtures arranged in a particular order today. This question has several parts (at least implicitly). Why separate single-colour lamps rather than one multicolour lamp? Why red, amber and green? Why are the colours in that order? Why are they arranged vertically? The answers to most of these questions arise from the historical development of the system. Many standards are the result of revision and refinement of a largely arbitrary precursor. It is often expensive (in human lives as well as financially) to change safety-critical conventions that have been learned by large numbers of people, even if there is a theoretically better system. Some early railroad signals do have several different coloured lights appear at the same single position. They had one lamp. A mechanical arrangement moved coloured lenses in front of the fixed lamp. Railroad signals were initially semaphore signals where the position of a signalling arm indicated whether it was safe to proceed. An important point is that, as a form of fail-safe, if the arm raising mechanism fails, gravity will drop the arm to the "stop" position. OK so road usage followed railway usage, this begs the question - why were those colours chosen by railways? The answer may be that the railways followed established maritime conventions. Ships had red and green lamps on their sides so that other ships could tell which direction the observed ship was travelling. There had to be a convention about which of two converging ships should give way. The convention was (apparently) that if you see a red light, you are required to give way. Another explanation was simply that red, the colour of blood, has long been associated with danger and so became associated with the need to stop. Railroad tracks are divided into sections. Following trains are provided with an indication that a train is on the section ahead (stop/red), has left that section and is in the section ahead of that (caution/yellow) or is much further away (proceed/green). For night time use, a lamp was added and the motion of the signal arm brought different coloured lenses in front of the lamp. You can see that with this arrangement, the "stop" indication is at the top position when the line of lenses are vertical. This is a consequence of the fail-safe arm arrangement discussed earlier. With road traffic signals, the semaphore arm was eventually entirely replaced by the lights. The mechanical elements were eliminated, perhaps because they required more maintenance, and three electric lamps were then the simplest signalling system. The colour, number and physical arrangement obviously followed the previous system to avoid confusion. It is obviously an advantage, where red-green colour-blindness is common, to have a positional reinforcement for the signal meaning. My best guess would be that if there was poor visibility or some sort of color blindness problem, one could identify what to do by seeing which light was on/or off. With 1 light one might not be able to tell what the color is and that could cause problems. There have been a couple of passing mentions of trains, where the constraints are interestingly different. Train signals (in the UK at least, but I don't think they're massively different elsewhere) are also red-amber-green (or on higher-speed lines they're red-amber-doubleamber-green), and they're not consistently one way up; so sometimes the red is at the top, and sometimes at the bottom. This is partly, I understand, because a train driver may have to react to them from further away than a car driver would react to a traffic light, so that they wouldn't necessarily be able to distinguish them based on position, and there is therefore no utility in requiring them to be in a consistent position. It follows (I recall, but can't find a link to corroborate) that train drivers can't be colour-blind. The order isn't random/whimsical, though. The lights are ordered so that the red light is nearest to the eye-line of the driver (see that Wikipedia link for lots more detail). And just by the way, the reason the four-light sequence is red, amber, and then double-amber (whereas you might initially guess that double-amber is ‘more cautious’ than single amber), is so that it fails safe: if an amber light fails then the signal displays the ‘more cautious’ single amber. Relevant to the original question, there are indeed now LED-based lights which have all the colours in a single housing, rather than one lamp per colour. Why are news sites articles one big block of text instead of broken down with subheaders? Was USB-A always intended to be reversible?